This particular aspect of development is one that I’m still experimenting with; however, there are certain aspects of it that have remained constant. To follow up with yesterday’s post, I thought I’d share several things that I’ve consistently done that have improved development as well as some of the things that I’m currently doing that are proving to be useful. 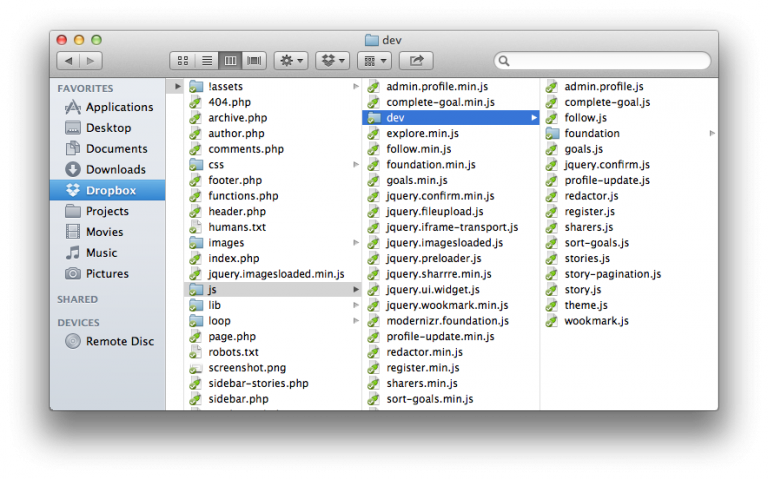 Once linted and minified, all files are written to the root of the js directory and suffixed with min.js. When I’m working on a plugin, then I’ll use the name for plugin.js and if I’m working on a widget, then I’ll name the file widget.js. JSLint is written and managed by Douglas Crockford. It enforces a strict set of rules and the coding conventions as prescribed by him. JSHint is a derivative of JSLint that is arguably a bit more relaxed, and is managed by a community rather than a single person. Generally speaking, I think using either tool is fine as long as you’re consistent (after all, you want your coding conventions to be consistent, right? ), but I’m actually a fan of JSLint primarily because I like Crockford’s standards and style. Then, on the server-side, I include each of these files whenever that specific page is being viewed. All of that said, there are still things with which I’m experimenting, but these are the things that have remained constant throughout my last few projects. As usual, I’m always interested to know how you guys organize your files, too so feel free to share them in the comments. Good stuff Tom. Keep it coming. Have you used require.js with WordPress at all? I’ve not – I’ve used head.js on a couple of projects in the past, but haven’t in anything recently. Developers argue usually a good deal about wp_register_script and wp_enqueue_script. Personally, I prefer to register all my scripts first and then enqueue them later when needed with just the handle. In your code example above it doesn’t really make sense to use both functions, though, as the story-submit script will only be registered and enqueued on a single post. Extensions and add-ons for your plugin or theme will have to register the script again when on another page and won’t be able to just enqueue it via the handle. If your project is not meant to be extensible, then it’s not an issue, but you never know what might happen. Basically, I register all scripts at init and then enqueue them conditionally at wp_enqueue_scripts. You’re absolutely right. In the example above, the call to register is redundant and isn’t necessarily needed – I could get by just fine with calling enqueue. I’m more of a fan of your approach – register first, then enqueue when needed. As far as extensibility is concerned, this is taken from a web app, so it won’t have any child themes or dependent plugins or anything like that, so it’s a non-issue (though a valid point!). Seriously. This shot is actually taken from a web app being built on top of WordPress. There’s a lot of different parts for several different areas, so keeping things separated has been better – especially for debugging – than having a single, giant file.